In these stunning shots of the launching of the Titanic, the entire ship is in view. 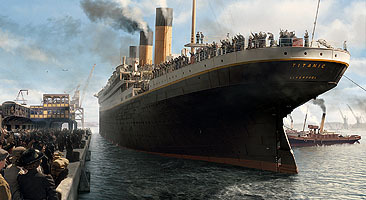 The constant presence of passengers on the Titanic's decks brings home the immediacy of the tragedy, as well as the realism of the ship sequences. For this shot, Digital Domain composited photography of the 1/20 scale miniature ship, along with numerous greenscreen-shot extras, and digital matte paintings to depict the Southampton dock. 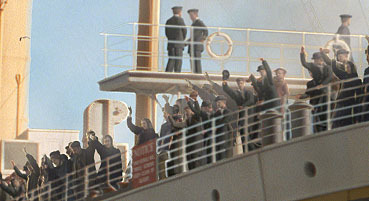 Waving Titanic passengers in wide shots of the ship are actually digital performers, animated via motion capture at House of Moves by Digital Domain. This image is not an actual shot in the film, but a detail section of the previously displayed shot, showing the digital passengers in an closeup. Although this kind of close scrutiny somewhat reveals the true nature of the passengers, it also sheds some light onto the massive amounts of painting and rotoscoping necessary to place the CG people behind the miniature railings. 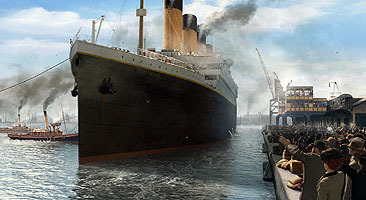 Within the natural scale of their shots, the digital passengers never disclose their real origins in any of the shots of TITANIC, due to their fine tracking and compositing. 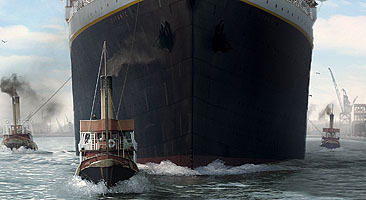 Another Digital Domain shot, this tilt-down shot ends with this image of Titanic leaving the Southampton dock. This extremely complicated shot includes digital smoke effects coming from the model miniature tug boats and digital matte paintings representing the sky and dock. The practically shot wake and digital water are plainly visible in this shot, and nearly fills the frame in various shots at sea, and it holds up to intense scrutiny.